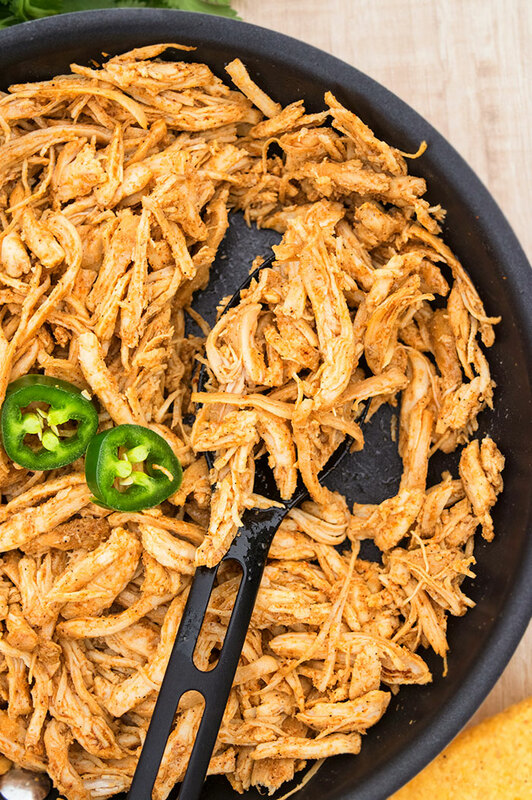 Quick and easy Mexican shredded chicken recipe made on the stovetop in 1 pot and only 30 minutes. Great for tacos, casseroles and sandwiches. Make a batch of this Mexican shredded chicken tonight and you will have endless meal options for the entire week! Before I even get into this post, let me just say that this is probably not the most authentic Mexican shredded chicken recipe but it still tastes AMAZING and you really have to try it! Can you buy cooked shredded chicken? 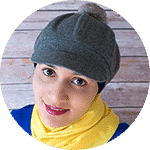 No, you cannot buy that but you can buy chicken breasts, cook it and shred it yourself. How to make Mexican shredded chicken? How do you make shredded chicken tacos? Start off by heating oil and sauteing onions until golden brown. Add chicken breasts, taco seasoning, salt and pepper. Cover and cook until chicken is tender. Shred chicken with 2 forks. Use in tacos or anything else you like. How do you cook chicken to be shredded? 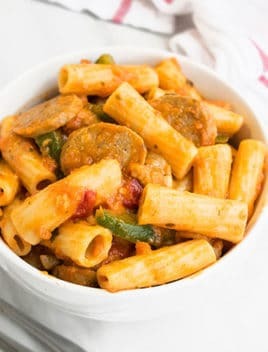 You can cook it with taco seasoning, onions and broth on stovetop or in the slow cooker or in the pressure cooker. What can I make out of shredded chicken? What do you do with leftover Mexican shredded chicken? 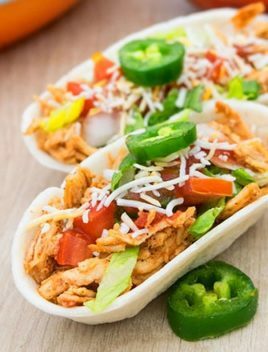 Chicken tacos- Use them as a filling in soft or hard taco shells along with any toppings you like. 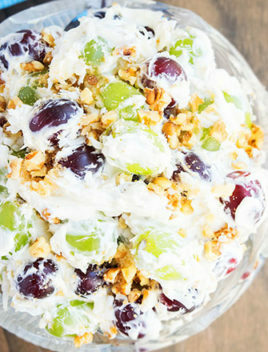 Mexican shredded chicken salad- Prepare a salad with your favorite vegetables and then mix in this shredded Chicken. Use salsa or enchilada sauce instead of dressing and you will have a deicious healthy meal. Mexican Shredded Chicken Dip- Combine leftover chicken with with sour cream, velveeta, cream cheese jalapenos, beans and tomatoes and dig in!! Mexican Shredded chicken sandwich- A couple slices of bread, lots of Mexican cheese blend and shredded Mexican chicken is all you need for this. 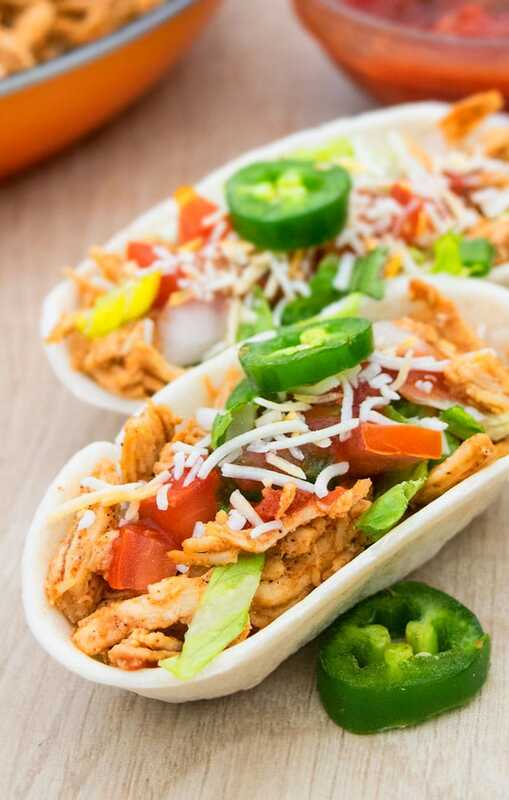 Mexican taco shells: Stuff the taco shells with this chicken and then add your choice of toppings such as cheese, lettuce, tomatoes, sour cream, salsa, guacamole. Bake until cheese is bubbly and enjoy! Use NON STICK pan to prevent the chicken from sticking and burning. You can use homemade or store-bought taco seasoning for this recipe. If you use FROZEN chicken breasts, you would have to increase the cooking time by a few minutes since it will release more water. If you want this chicken filling to have more sauce, DON’T reduce the water completely. Turn off the heat when you have a thick mixture. 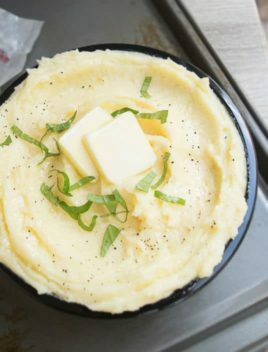 This recipe can be used BEYOND tacos. Use them in other Mexican recipes like enchiladas, burritos, quesadillas, sliders OR serve them with Mexican rice or cilantro lime rice. To make crockpot or slow cooker Mexican shredded chicken, just dump all the ingredients in the slow cooker. Cover lid and cook on high for 2 hours. 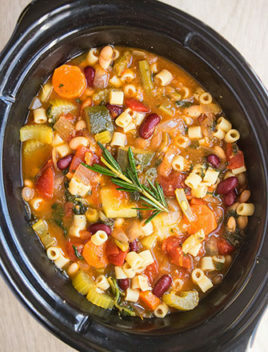 Timing may vary depending on the type of slow cooker you use. To make SPICY shredded chicken, add more red chili flakes or some chopped jalapenos while cooking. 1. Heat oil in a non stick pan over medium heat. 2. Add onions and chicken and cook until chicken is no longer pink and onion is golden brown. 3. Stir in taco seasoning, salt, pepper and water or chicken broth. Mix thoroughly. 4. Cover and cook for about 15 minutes. 5. Remove the cover and cook until water is reduced and chicken is cooked through, making sure to stir every few minutes. 6. Turn off the heat and use two forks to shred the chicken. 7. 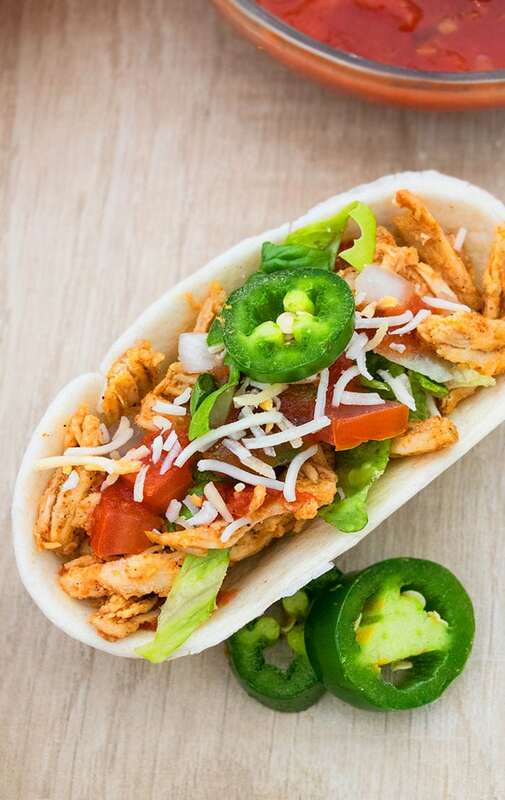 Fill your hard or soft tacos with shredded chicken and your choice of toppings and enjoy!